It’s easy to put off thinking about issues that may arise from breaches of lease covenants relating to the condition of your property, but it’s important for businesses to ensure they’re one step ahead from the outset. The best way to avoid major cost implications when it’s time to exit the property, is by having a clear understanding of your obligations and any opportunities to mitigate the potential for a claim. Financial Reporting Standard 102 (FRS 102) applies to many businesses in the UK. It requires that those businesses make proper estimations of their liabilities linked to their lease contracts. All too often, tenants underestimate these costs and are landed with a much larger than anticipated final dilapidations bill from their landlord. Whether your commercial property lease is due to expire, you’re approaching a lease break or you’ve recently entered into a new lease, the below guide will help you protect yourself from any unforeseeable costs associated with dilapidations. Timing is everything – the earlier you start to prepare, the better equipped you’ll be. What should you budget for? removal of any alterations made to the property during the course of your lease. It’s vital you understand the exact extent of your repairing and reinstatement obligations well in advance, to allow you to adequately budget for these costs throughout the life of your lease. Depending on your circumstances, there are a number of options that could help you manage costs and prepare for repairs and dilapidations costs. Seek advice – specialist input from a surveyor early in your lease will ensure you fully understand the nature of your repairing and reinstatement obligations. Take control – source a reliable estimate on your dilapidations liabilities from an expert and accrue the appropriate financial provision during the course of the lease. Ongoing work - consider implementing a programme of planned maintenance on your property to manage your future liabilities. 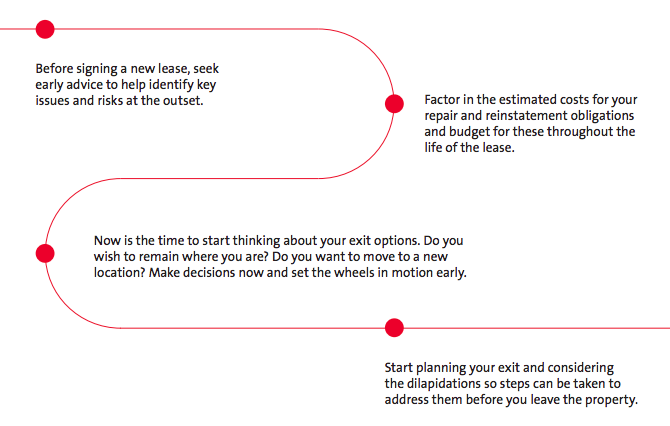 Lease re-gear – in some situations it may be beneficial to stay where you are and negotiate better terms with your existing landlord. Cash settlement - your landlord may accept a cash settlement as an alternative to the repair or reinstatement works being carried out on your property. Early advice is key to minimising the risk of a contentious dilapidations claim. Specialist input from a surveyor will ensure you fully understand the implications of the obligations in a lease. Being armed with this expert advice early on in your lease will enable you to take the necessary steps to make appropriate financial provisions – either for undertaking the required works or dealing with a claim at the end of the lease. We have extensive experience in advising occupiers in relation to their dilapidations liabilities at all stage of their leases. Through our expert advice, we can help you plan for the future, whilst also helping you to limit existing liabilities through expert negotiation and in-depth knowledge. We have a free PDF with advice on dilapidations available below. For help or advice in relation to your lease liabilities, or to minimise future dilapidations claims, get in touch with our expert team of advisers. David Castle is based in our Reading office.